Tangled and True: robot party. 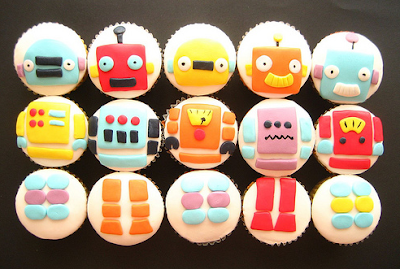 When I saw these incredible robot cupcakes a couple months ago they immediately went into my "save" file. My ideas were swirling to come up with some kind of amazing robot party. I don't even have a little boy yet, but you can be sure, when I do, this party theme is at the top of my list. 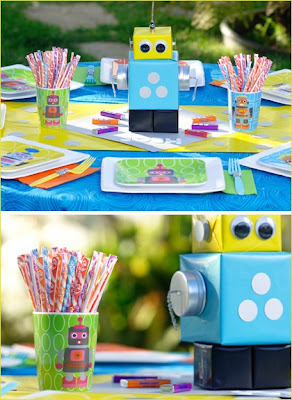 Then the other day I was browsing the hostess blog, and found that she had actually planned and executed her own robot party using the same cupcakes. Her tablescape is highly impressive and far surpasses anything I could have ever come up with. Combined with some cute Robot pins for your goody bags at the end and the robots movie I think it might make a party to be remembered. OMG! Those are the loveliest robot cupcakes ever! Props to whomever did them!! I heart! I love it! I might just have to borrow this idea for my son's birthday coming up :) Thanks! this is hilarious. I want one! so funny...i saved those cupcakes as well and the party!! I can't wait to try this one out.